According to report, Xiaomi Redmi Note 7 has been launched in China last month. The phone is now available with 6.3 inch screen with 1080 X 2340 Pixels which has 48MP primary camera and 5MP secondary camera + 13MP selfie shooter camera. When we talk about Samsung Galaxy M20 (latest Galaxy phone of Samsung) has been released in December 2018. It comes with 6.4 inch HD screen with 1080 X2340 Pixel resolutions which has 13MP rear camera and 8MP front camera. Let’s take a look which one is better Smartphone and which has better Camera quality? When we talk about Redmi Note 7 phone, it is supported to take some sweet daylight and nighttime shots with its 48MP back Camera sensors. This sensor is quite big at ½” and uses 0.8µm pixels. Interestingly, the camera shoots at 12Mp with large 1.6µm pixels which captures the more light and significantly reduce the noise. It has secondary 5MP camera sensor which is used for depth sensing when the depth effect is needed in portrait mode. Redmi Note 7 has fantastic camera supports which have good contrast, colors, punchy, although inaccurate and noise virtually non-existent. We have researched for its image quality and finally we get magenta tint on some of the photos in our lab samples which are looks like an issue with white balance in certain scenarios.Let’s look at picture taken in daytime here. Interestingly, Note 7 has impressive image quails during nighttime shooting. There is not prominent noise, details are good and light sources appear to be rather well— preserved. The Smartphone would snap brighter exposures with higher ISO than previous Xiaomi phones.Let’s take a look at picture taken in nighttime here. When we talk about selfie camera sensor of Redmi Note 7 phones, it has 13MP selfie shooter which takes sweet pictures. The Portrait mode also seems to do quite well despite the hardware limitations of front facing camera. When we talk about Samsung Galaxy M20 phone, It has 13MP rear camera with 1/3.1” Samsung S5K3L6ISOCELL Fast sensor and 5MP 120-degree ultra-wide lens with f/2.2 aperture. It has also an 8MP camera on front with f/2.2 aperture. Interestingly, you can switch between the normal 78-degree Field of View main camera and 120-degree Field of View wide angle camera easily. Even though, there is live Focus which uses to blur the background in the image since the wide-angle sensor cannot be used for it. Samsung M20 takes good quality of pictures in daytime/daylights. The autofocus speeds are fast and accurate. Even though the edge look a bit curved due to the lens, but the “Sharp Correction” in the Galaxy M20 lets you fix it. On other hand, low light performance is just average and there is a lot of noise. 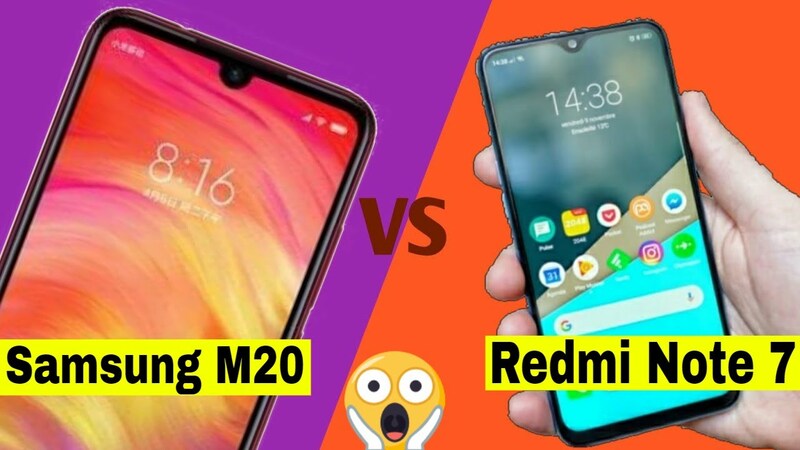 Here, we have discussed about the comparison of camera features of Redmi Note 7 and Samsung M20 phones. We all have already known that Redmi Note 7 has 48MP +5MP dual rear camera and 13MP front camera, while Samsung M20 has 13MP + 5MP dual rear camera with 8MP front facing camera. From long discussion, we are seeing that Redmi Note 7 has better camera quality than Samsung M20 phones. What do you think? Which one is better phone which better camera supports? You can share your through on the comment box given below. You may also read: Exynos 7904 Vs Snapdragon 632: Which supports better Camera, Architecture, CPU?